The Methodist Fremont Health Medication Assistance Program (MAP) is a community benefit program that provides critical assistance to patients in obtaining medications who are uninsured, underinsured and with financial needs. The MAP program also works with patients and physicians to find generic alternatives to costly brand name medications. 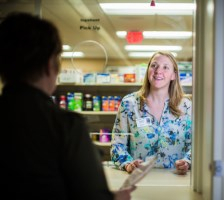 Methodist Fremont Health donates staff pharmacist time through MAP, allowing Methodist Fremont Health pharmacists to work with patients and their physicians to prescribe the most cost effective medications. The program helps approximately 150 patients each year. Donations help Methodist Fremont Health continue to supply MAP patients with a one-time prescription to ensure they do not go without critical medication while external assistance program medications are being mailed to them. Patients often go two to three weeks without medication while manufacturer programs are initiated. MAP funds will provide these medications through the Methodist Fremont Health Pharmacy at no cost or at a reduced price for patients, allowing Methodist Fremont Health to serve more people in our community.